Molly Corbett Broad is President Emerita of the American Council on Education. A leading spokesperson for American higher education, Molly Corbett Broad became the twelfth president of ACE in 2008. She is the first woman to lead the organization since its founding in 1918. Ms. Broad came to ACE from the University of North Carolina (UNC), where she served as president from 1997-2006, leading UNC through a period of unprecedented enrollment growth. Due in large part to the success of the Focused Growth Initiative, minority enrollment at UNC grew at more than double the rate of the overall student body during her tenure. She also spearheaded the creation of a need-based financial aid program for in-state undergraduates and the creation of the College Foundation of North Carolina. Ms. Broad held a number of administrative and executive positions at several universities prior to her tenure at UNC. At the California State University system, she served as senior vice chancellor for administration and finance from 1992–93, and as executive vice chancellor and chief operating officer from 1993 until her election as UNC president. 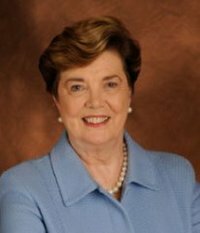 Earlier in her career, Ms. Broad served as the chief executive officer for Arizona's three-campus university system (1985–92) and in a succession of administrative posts at Syracuse University (1971–85). Ms. Broad has written and spoken widely on strategic planning for higher education, K–16 partnerships, information technology, globalization and biotechnology. She currently holds a seat on the TIAA-CREF Board of Overseers and the GED Testing Service, LLC. In addition, Ms. Broad also serves on the boards of the Forum for the Future of Higher Education, Business-Higher Education Forum, United Way USA, National Security Higher Education Advisory Board, and Homeland Security Academic Advisory Council. She is past chair of the National Association of State Universities and Land-Grant Colleges, past chair of the Internet 2 board of trustees and past president of the International Council for Distance Education. She previously served on the PBS Board of Directors from 2007-2013, and was Vice Chair from 2011-2013. She has served on the boards and executive committees of the Parsons Corporation; RuffaloCODY; Council on Competitiveness; National Association of University System Heads; and the Centenary Committee for Fudan University in Shanghai, China. Ms. Broad earned a General Motors Scholarship to Syracuse University, where she graduated Phi Beta Kappa with a baccalaureate degree in economics from the Maxwell School of Citizenship and Public Affairs. She holds a master's degree in the field from The Ohio State University. Ms. Broad serves on the Finance, National Policy Advisory, and Diversity Advisory, and Corporate Support Advisory committees. She previously was chair of the Finance Committee, vice chair of the PBS Strategic Planning Advisory Group and served on the Nominating and Corporate Governance Committee, Investment Subcommittee, and the Dues Review Task Force.